The RMC Enactus team is currently fundraising in order to travel to a regional competition in Bentonville, Arkansas, in April 2016. With success at regionals, the team hopes to continue to the national competition in St. Louis, Missouri, in May 2016. Members of the well-known campus business club will be fundraising by selling cans of the popular orange flavored soda, Sunkist, in the Bair Family Student Center from 11am – 1pm, Monday, February 8 through Friday, February 12. 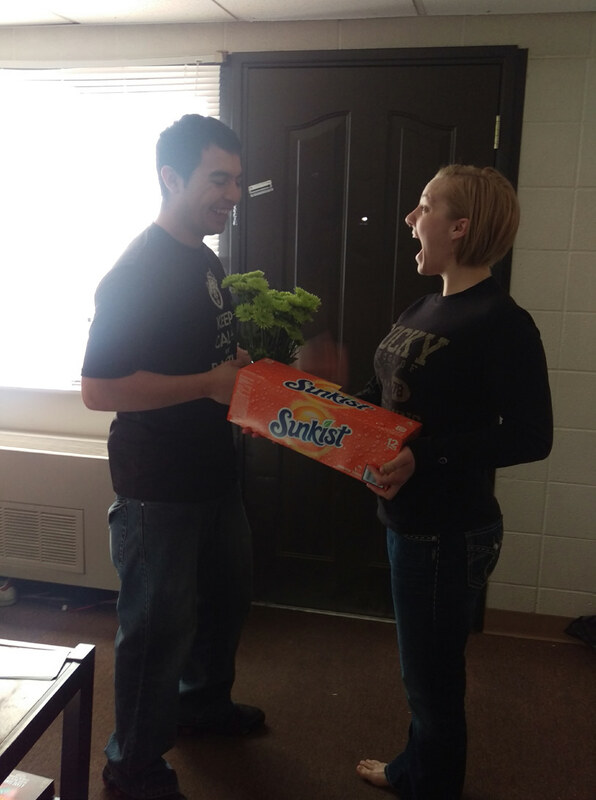 Students will be able to purchase cans of Sunkist to be delivered to roommates, friends, or even crushes for Valentine’s Day on Sunday, February 14. National competitions are held across 36 countries to showcase how students from across the world are transforming lives for the better and enabling progress through entrepreneurial action. Business leaders will serve as judges in order to evaluate the quality and impact of each individual team’s projects. These events aim to inspire and encourage creativity, while rewarding results, ultimately improving more lives. Enactus believes, “When we compete to improve lives, we all win.” At this year’s competition the RMC Enactus team will present four projects: “Rock Slam,” “Suit Up,” “Work Force Women” and “Broken Glass to Working Class,” for which the team recently won a $25,000 grant. As an additional fundraiser, the RMC Enactus team also prints and sells their own Rocky apparel, so look out for their upcoming spring sales for great discounts on Rocky gear. Not only is Enactus a business club on campus but it also serves as a two-credit class. If you are interested in becoming a member of the team and getting involved in order to help your local community, you can contact Karen Beiser, in Morledge-Kimball Hall, room 105 or any member of the Enactus team for more information. You can also keep up to date with the team’s progress on social media sites, including Facebook and Twitter. This entry was posted in Issue 7 and tagged Broken Glass to Working Class, Don't Resist, Enactus, Hope Bradley, Karen Beiser, Suit Up, Sunkist, Valentine's Day, Work Force Women. Bookmark the permalink.